Born from the comings and goings of the NASL’s sordid past—a league who allowed clubs to leave in the middle of the night, set up shop in a new town, give birth to new soccer fans, just to pack up a move again—The Oakland Stompers came to the Bay Area in 1977-78 after leaving Connecticut under those exact circumstances. They would only stay for one season, and although there was another NASL team in San Jose, some Stompers fans never forgot the heights of having a team of their own in the first division of US Soccer. Shep Messing, well-known for his time in both the NY Cosmos, as well as his full spread reveal in Playgirl Magazine, came to Oakland with the Stompers in 1977-78. The former teamate of Pele, Giorgia Chinaglia and Franz Beckenbauer became the highest paid player in the league that year, making a cool $100,000 for the season. He and his 1978 soccer team would play in the cavernous Oakland Colliseum, which was also the home of the Oakland A’s (World Series winners in 1974) and the Oakland Raiders (Superbowl Champions of 1976); the East Bay had a recent history winners and a fiercely loyal fanbase. Shep Messing Played in the iconic Oakland Stompers kit of 1978. Although the club inevitably left a year later, as NASL clubs were prone to do, the single season left a lasting impact on soccer fans in the cities which make up the East Bay Area; Hayward, San Leandro, Richmond, Fremont, and of course, Oakland. So decades later, when given the chance to start a brand new club to join the NPSL in 2012, the owners borrowed over the nickname Stompers—it was a natural decision, of course, they had been using the nickname for years anyways for their youth teams. Along with the name, came the inspiration for their kits, and now the Oakland Stompers of the UPSL wear their heritage on ther back. We asked Stompers’ President and General Manager, William Forte, for the lowdown on their kits and common denominators between the current Stompers and the connection to their namesakes. He spoiled us with photos of the kits during their WIP (Work in progress) stages and confirmed the historic backdrop of the Stompers in Oakland. The 1978 NASL Oakland Stompers in their away whites. Could you explain the history and meaning of Stompers in the Bay Area? 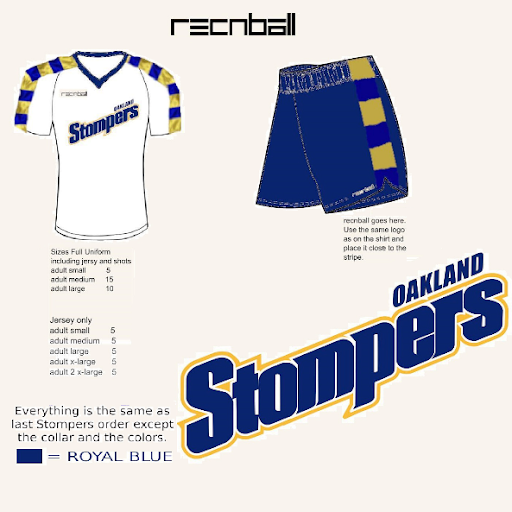 The Stompers were the last top tier professional soccer team to play in the East Bay/Oakland. That was over 40 years ago. The original logo had grapes in it to represent the Northern California region of wine country. So, the significance was from grape stomping which is a big process of turning the grapes in to wine. The 1978 NASL team had cheerleaders named the Corkpoppers. After the team folded in 1978 a number of youth clubs carried on the Stompers name. Our club was formed in the East Bay on the youth side named after the Stompers that lasted from 1984- the mid 90's and had the Stompers, Stompettes, and lil' Stompers. We brought back the club in 2008/09 as a men's team hoping to climb the ranks of US Soccer to bring the Stompers back to the heights of pro soccer representing Oakland. After a decade of obstacles, we have finally brought the Stompers back home to Oakland where it all began and where we belong! Four decades later, the 2018 Oakland Stompers in their beautiful light blue shirts. Who is your provider and why did you settle on them? Our jersey brand is Recnball. It is our own brand that we are developing along the way. We paired with soccermagic.com because they allowed us to fully customize our own brand. I think having complete creative control on this project was important to us. Soccermagic.com allowed us to do that. I recommend them to anybody who is looking to have their own unique style and creative control. How long was the process of design and choosing the right kit provider? The revitalization of the original jersey was a plan since the club reemerged in 2008/2009. The current plan was to reveal the throwbacks Spring 2018 for the East Bay FC Stompers and do a 40-year throwback season. We were not able to accomplish that on time. We were able to bring out the blue kits in the Fall as we brought back the Oakland Stompers for a 40-year commemoration season. This Spring we plan to continue the honor to the original Oakland Stompers with revealing here first the unveiling of the 1978 Oakland Stompers white throwback kits which will be our second kit for both the East Bay FC Stompers and the Oakland Stompers as we continue our throwback season tribute. After we decided on SoccerMagic.com the current process to get to this point has taken us over a year to get things the way we wanted them. We have thrown around working with bigger name brands but currently we like our own creative freedom with our own brand and SoccerMagic.com. If we did go with a more reputable brand the current front runners would be Hummel as their Northern California representative Kevin Campbell has been nothing but awesome to us. We like how a custom blue and gold Hummel chevrons on the shoulder would fit in our style but allow us to become completely modern and our own new East Bay/Oakland Stompers stamp on US Soccer history. Be on the lookout for a completely new Stompers look in 2020!